Healthy news and information from Harmony Orthodontics. Is Your Tongue a Funny Colour? Your tongue provides insights into your overall health. It should be pink, moist, smooth and glistening. When it isn’t, see a professional. White – If your tongue has a white coating it could be a fungal infection. That means something has upset the normal bacteria balance in your mouth. A patchy white covering of your tongue could be leukoplakia, often seen among smokers. Red – Pink is normal but if your tongue is bright red you may have scarlet fever. A fever and rash may accompany this highly contagious bacterial infection. Seek professional help immediately. Black – Another sign of unusual bacteria growth is a black or dark brown hairy-looking coating. Reducing sugary foods, better brushing and quitting smoking can often help. Purple – If your tongue appears a shade of purple or violet, no need to be alarmed. You’ve merely had some grape juice. If you haven’t had any grape juice call us! If your spouse refuses to see a dentist, he or she may be suffering from odontophobia (dental phobia). If you take good care of yourself, you may see their reluctance as groundless. It isn’t. Bad experience – One reason why some avoid the dentist is the fear of pain. With so many advances in dentistry this is rarely an issue today. 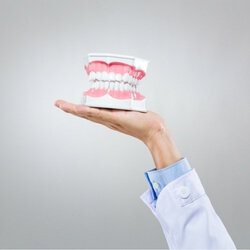 Our goal is great dentistry in complete patient comfort. Fear of judgment – If it’s been some time, they may worry that we will judge or scold them for their inattention. Relax. We’ll simply be thankful for the opportunity to be of service. Avoid nagging, which is rarely successful. Remind your spouse that poor oral health leads to a higher risk of heart disease. And that their dental anxieties can be unwittingly transferred to their children. And how it interferes with you wanting to kiss and be intimate. The chewing surfaces of our back teeth have pits and grooves (fissures). This gives our premolars and molars the ability to grind food for swallowing. But they also can trap food and foster bacterial growth. Which can lead to cavities. Dental sealants can be an effective way to protect your teeth. A plastic-like liquid is applied to the most vulnerable chewing surfaces. Both adults and children can benefit. We generally recommend this semi-permanent solution when the first molars appear. Usually around the age of 6. Then when the second molars emerge around age 12. Granted, sealants are no substitute for regular brushing and flossing. But they can help prevent cavities from forming. A 2012 study suggested that sealants can cut the rate of cavities in half. And when you consider that sealants cost a fraction of what it costs to fill a cavity, you can see why this is a popular choice.